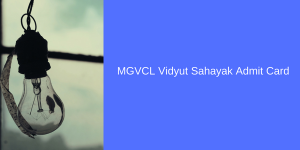 MGVCL Vidyut Sahayak Admit Card 2018 for 69 posts of Junior Assistant to come soon. 16th August is the last date for online application form fill up for Gujarat MGVCL JA Application Form Fill up. Therefore, after that date, track your Online Examination for Madhya Gujarat Vij Company Limited Junior Assistant Admit Card. Further details regarding the Downloading date of MGVCL Vidyut Sahayak Exam Date 2018 for CBT online test/written exam will come in due time. We will update the direct link to avail MGVCL VSJA Admit Card once officially uploaded on www.mgvcl.com for your easy access. Latest Update: MGVCL Vidyut Sahayak Admit Card 2018 Released Soon. MGVCL Vidyut Sahayak Admit Card 2018 Exam Date Junior Assistant Hall Ticket Download: MGVCL Vidyut Sahayak Exam Date 2018 has not been declared yet. As per the employment notification issued by Madhya Gujarat Vij Company Limited on behalf of GUVNL and its subsidiary companies namely UGVCL, DGVCL, PGVCL, MGVCL and GSECL online applications have been invited from the eligible candidates having sound knowledge of Computer and Gujarati language, for the post of Vidyut Sahayak – Junior Assistant (69 nos.) to perform the duties like meter reading, doing billing works and other back office operations at the field offices. The process of online application through the website: www.mgvcl.com/jobs.php has been started and it will continue till 27th July 2018. The candidates while filling up the online application of Madhya Gujarat Vij Company Limited Vidyut Sahayak post must indicate their preference for the companies in descending order else they will not be allowed to proceed. After successful form fill up the applicants need to send hard copy of their application along with the fees deposit challan to the postal address of the recruitment authority. If any candidate fails to do the same within the specified time limit, then his/ her registration will not be considered to be valid and henceforth no admit card will be issued for the online/ written test. The admit card will be issued to those candidates who have successfully submitted the applications following all the specifications and fulfilling the eligibility criteria of Vidyut Sahayak- Junior Assistant primarily. The mere issuing of Admit Card would not mean that the candidate has fulfilled all the eligibility criterion as it will be verified in due course of time by the recruitment authority of MGVCL. Moreover the company reserves the sole right to select or reject the candidates for the online/ written test. The exact date for the issuing of the Admit Card or online/written test for the post of Vidyut Sahayak has not been declared by MGVCL yet but we’ll inform you from time to time regarding this through our website : www.jobsandhan.com. Admit card downloading link will be updated here. Login to the portal www.mgvcl.com. Then enter your birth date and MGVCL Application number. Click on submit button to generate the call letter online. You need to print MGVCL Jr Asst VS Admit Card 2018 in order to appear in the exam hall. Also, do not forget to take any Valid Identity proof with you in the exam venue. For further details, check the official portal.